The 2nd Official Test at the Sepang International Circuit gave us another hint of where the packs are stacked, and worryingly for the rest of the competition it was Honda’s dominance throughout the 1st and the 2nd test that grabbed all the headlines. Honda looked to have a significant advantage over their rivals with the RC212V, posting all the fastest laps and dominating the top 4 positions on the timesheet. Casey Stoner, MotoGP 2nd Official Test at Sepang 2011. Repsol Honda rider Casey Stoner broke Valentino Rossi’s lap record at Sepang with a time of 1:59.665	on the third day. Stoner’s new lap record is 0.853 seconds faster than the lap record of 2:00.518 set by Rossi in 2009, underlining Honda’s progress with the RC212V. The new record was set using the harder option front tyre coupled with the soft rear. Most riders preferred the same configuration as Stoner because the harder option front tyre provided more stability under braking on the high track temperature and the heavy braking points after the long straights at Sepang while the soft rear gave an extra traction and grip. On the 3rd day, Stoner did a 14 laps stint and consistently lapping in the 2:01 bracket and on three occasions managed to do a lap in the 2:00 bracket. It is very interesting to note that no other riders managed to do a lap in the 2:00 bracket when they do a stint of 10 laps or more. Early signs look promising for the 25 year old Australian and he will be the bookmakers’ favourite for the 2011 season. 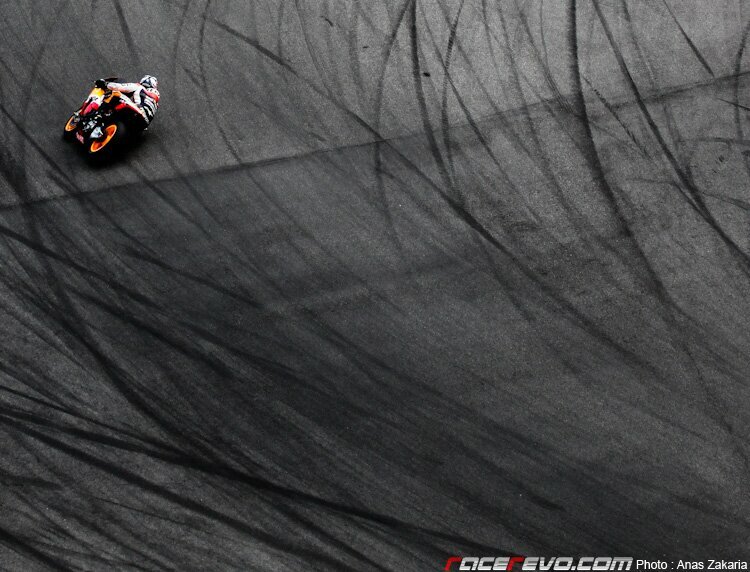 Dani Pedrosa in action, MotoGP 2nd Official Test at Sepang 2011. Only two riders managed to get their fastest lap below the 2:00 mark, the other one is Dani Pedrosa with a lap of 1:59.803, just 0.138 seconds slower than his teammate. Pedrosa did a 10 laps stint in the evening on the 3rd day, lapping consistently in the 2:01 but unlike Stoner never quite managed to get into the 2:00. His fastest lap during the stint was a 2:01.281. Dani Pedrosa preparing to go for a stint, MotoGP 2nd Official Test at Sepang 2011. It is too early to tell if Stoner had a slight speed advantage over Pedrosa or it’s just a case of both of them running on a different testing programme, but judging from the testing times Stoner’s closest challenger for the title might come from within the Repsol Honda team in form of the 25 year old Spaniard. Andrea Dovizioso under braking into Turn 7, MotoGP 2nd Official Test at Sepang 2011. Andrea Dovizioso seems to struggle a bit in finding the balance of the RC212V, and was not lapping in the same pace as Stoner and Pedrosa did. He did a 15 laps stint in the 3rd day with 10 out of the 15 laps in the 2:02 bracket. The other 5 laps was in the 2:01. In comparison, Stoner did a lap in the 2:02 only once in his 14 laps stint while Pedrosa did the same twice in his 10 laps stint. Dovizioso’s fastest lap in his 15 laps stint was a 2:01.349. After completing his long run, Dovizioso said that he had a problem in the front and after a few laps lost some grip in the middle of the corner, caused by adding five litres more of fuel which disrupts the balance of his bike. Marco Simoncelli under braking into Turn 1, MotoGP 2nd Official Test at Sepang 2011. Marco Simoncelli continued from where he left from the 1st test, registering a fastest lap of a 2:01.033. Simoncelli did a race simulation on the final day with a 20 laps stint, the longest run any riders did in the 2nd test. His lap times were slightly slower than all the factory supported Repsol Honda riders, with all but 4 laps done in the 2:02 bracket. He managed to a fastest lap of 2:01.998 and on three occasions did a lap in the 2:03. Despite the slow lap times, Simoncelli was not too worried and said that the performance was more down to a poor choice of tyre and suggesting that it would have been better to go with the softer one like the others and he would have been quicker in the race simulation. Simoncelli could be in for a great season judging from the test, and if he could take advantage of Honda’s early dominance might cause a few surprises down the line. Provided that Honda is indeed the class of the field, all he needs to do now is deliver. Jorge Lorenzo, MotoGP 2nd Official Test at Sepang 2011. After the 1st test, it seems that Yamaha has fallen slightly behind Honda in terms of bike development. In the long run, the Yamaha M1 are quite competitive but it was qualifying and the beginning of the race that is where the pace is lacking. Yamaha believes that the problem lies with the new M1′s inability to maximize its potential with the soft tyre. Jorge Lorenzo in action, MotoGP 2nd Official Test at Sepang 2011. Jorge Lorenzo’s longest run was a 19 laps stint, with the fastest time of 2:01.643. Lorenzo had no trouble lapping the circuit in the 2:01 bracket, only dipping in the 2:02 on six occasions. However, Lorenzo’s majority of the lap was done in the high 2:01, compared to Stoner’s majority which was done in the low 2:01. Lorenzo did eleven consecutive laps in the 2:01, averaging at 2:01.8 seconds. However, Stoner managed to do thirteen consecutive laps, three times in the 2:00 and ten others in the 2:01, averaging at 2:01.2 seconds. On the long runs, the gap that Honda has to Yamaha stands at anywhere between 0.7 to half a second which is quite a lot. Ben Spies, MotoGP 2nd Official Test at Sepang 2011. Ben Spies in action, MotoGP 2nd Official Test at Sepang 2011. Ben Spies was one of the riders that made the most progress from the 1st until the 2nd test. He ended the 2nd and the 3rd day with a faster lap times than Lorenzo and his fastest lap of the test was a 2:00.678. Spies didn’t manage to do any long runs on the final day as he is still suffering from his fall on the 2nd day and was not in an ideal condition. He managed to do a short stint of five laps in the mid 2:01, but the question remains on how well he will fare in the longer runs against the likes of Stoner, Pedrosa or Lorenzo. One thing is certain however. Ducati is definitely struggling. Valentino Rossi did a fastest lap of a 2:01.469 on the final day of the test and Nicky Hayden managed to equal Rossi’s time to the exact millisecond in the evening, only sufficient to put them in 11th and 12th in the timesheet. Valentino Rossi, MotoGP 2nd Official Test at Sepang 2011. To make things worse for Ducati, Rossi caught fever and a cold on the 2nd day and had to cancel his testing programme. Rossi managed to continue on the final day with the longest run of six laps, the fastest was a 2:01.469. The prospect of the title with Ducati is not looking good for the 32 year old Italian, but nobody would write off his chance for the championship so early as this is Valentino Rossi we’re talking about, so write him off at your own peril. Nicky Hayden, MotoGP 2nd Official Test at Sepang 2011. Because of Rossi’s illness, Ducati had lost valuable testing times and had to rely on Nicky Hayden to complete the test programme. Hayden did a stint of nine laps in the final day, but his pace is nowhere near the front runners. He said after the test that they’ve just been trying to improve the feeling and eliminate stuff that didn’t work, focusing mainly on finding a base setup that could work for the season. There’s still time for Ducati on the final test session at Qatar to try and improve the Desmosedici GP11 before the season starts at the end of this month. Unlike the 1st official test at Sepang, most teams opted to work behind closed doors in an attempt to guard their trade secrets from leaking to other teams and the media. After the three day test session, it was Honda who looked to have a significant advantage over their rivals. Yamaha is currently only second best, still a bit behind Honda while Ducati needs to step up its development programme if they are to mount a serious challenge for the championship. If you were a betting man, the smart money would be on Casey Stoner for the title but the season is very long and things could change when the bikes lineup for the start in three weeks time. Pramac Racing Team mechanic dismantling the clutch plate on Randy De Puniet’s bike (above), replacing it with a new one (below). Pramac Racing Team mechanic refueling De Puniet’s bike. Atmosphere, MotoGP 2nd Official Test at Sepang 2011.